Construction at South Cove: Construction of launch ramp is ongoing and launching is fair. Water level is falling. Lake level is approximately 1089. 4-Wheel Drive Highly Recommended!! Where are we? Meadview is located in northwest Arizona at the point where the Grand Canyon ends and Lake Mead begins. At 3400 feet elevation Meadview enjoys summers a little cooler than the low lying deserts and winters a little warmer than the mountain areas. Directions from Las Vegas, Nevada: Go South on Highway 93 across the bridge at Hoover Dam, continue to milepost 42 and turn left on to Pierce Ferry Road past Dolan Springs to just past milepost 34. 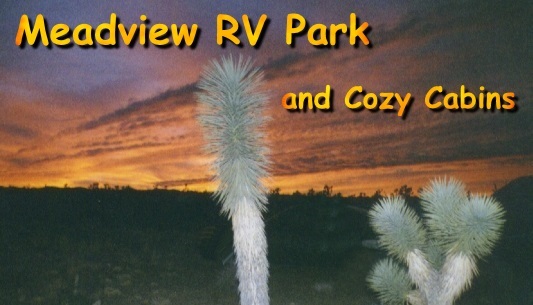 Turn right on Sandview Road and immediately left to the RV Park. Directions from Kingman, Arizona: Go North on Stockton Hill Road and turn right on Pierce Ferry Road continue to milepost 34. It is about 60 miles from downtown Kingman. Pierce Ferry Road is county highway 25, and is paved the entire length. Watch out for cows, deer, wild horses, (and for the Sheriff) ! NOTICE: IF YOU ARE USING A GPS.... DO NOT USE ANTARES ROAD! IT IS NOT A PAVED ROAD! GO TO STOCKTON HILL ROAD INSTEAD.... IT IS PAVED. Services Available: Most of the services that you might require are available in Meadview: and , ATM, minor groceries, gasoline, diesel fuel, motels, post office, hardware store, religious services, some auto repair, restaurants, etc. Our newest addition is a Family Dollar store not far away. We do not, as yet, have a super market. Propane: We have a Propane Filling Station to top off our amenities. Our price compares to other facilities. Boating on Lake Mead is at its best at this end of the lake. Crystal clear water, fantastic scenery, miles of open water and clean beaches. Peace and solitude are yours for the asking - and the fishing is great! 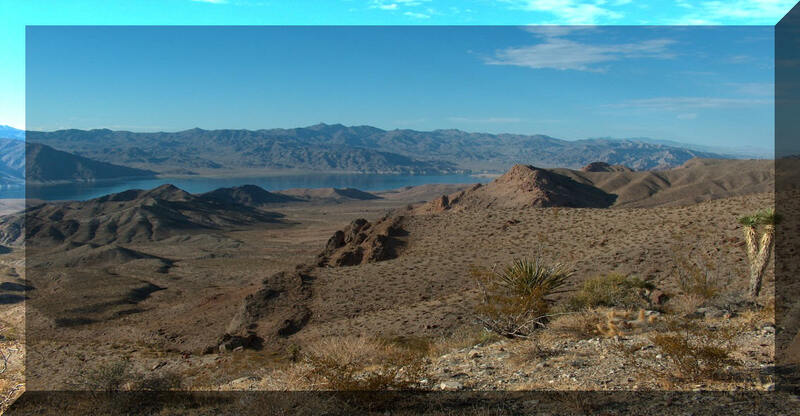 Lake Mead National Recreation Area has over 3000 square miles of environmentally protected riparian scenery. According to the 1998 "Information Please" Almanac, Lake Mead is the largest National Recreational Area in the United States with an acreage of almost one and a half million acres. Beginning at the east border are the Grand Wash cliffs which rise to 6000 feet. The cliffs are the gateway for the Colorado River as it leaves the Grand Canyon and becomes Lake Mead. The lake is 115 miles long, terminating at Hoover Dam (the tallest dam in the Western Hemisphere.) The dam rises 726.4 feet from bedrock to the paved road across this mile long concrete marvel. Lake Mead is America's largest man made lake covering 229 square miles with a storage capacity of 30 million-acre feet of water. The 500 miles of shoreline changes dramatically from one area to the next with steep cliffs, deep coves, sandy beaches and always a vast panorama of photographic opportunities. The eastern end of the lake is fabled for its fishing. Fish to be caught include bluegill, large and smallmouth bass, striped bass, that can reach monster sizes of up to 60 pounds, catfish (also known to acquire monsterous proportions), and once in awhile, a trout. In the coves or on the cliffs that line the lake, you can see the majestic desert bighorn sheep. The rams are sturdy animals carrying massive curved horns and boasting large harems of ewes with their young. The wild burros, descendants of those left behind by discouraged prospectors, drink at the water's edge, as do bobcats, cougars, and coyotes. Few nights pass without a serenade from a family of coyotes. Badgers, cottontails, the wily black-eared jackrabbit, and even deer can be found within the park boundaries. Antelope are quite rare, but are seen occasionally. Gila Monsters are sometimes spotted and shot by camera, as you can see below. Gambel's quail thrive in our area, sometimes numbering in the hundreds as they search for seeds under the brush. In season, bird watchers can find over 250 species of birds ranging from 5 kinds of humming birds to the osprey, golden eagle, and even the bald eagle. There are 60 species of waterfowl including ducks, herons, brown pelicans, geese, coots, terns, and the small swan-like billed grebe, and the "lesser" grebe. Songbirds, owls, hawks, ravens and the turkey vultures are constant visitors to the area. At Grapevine Springs, you will find beds of the scarlet monkey flower. The yellow wild columbine trails over the cliffs at Columbine Falls. Throughout the rest of the area you will find desert plants that survive our dry climate with only six inches of annual rainfall. This generally occurs in July, August, and again in February. On rare occasions during the winter months we have had some snowfalls of between 2 and 5 inches. In the dry washes of the mesa you can spend many hours digging for gold - and you can find it! A 12-ounce nugget was found by a weekend gold seeker a few years ago and dozens of others have found smaller nuggets and flakes. The hiking and 4x4 trails are numerous and selection of difficulty is wide. You can visit the awesome beauty of the Grand Canyon on the Hualapai Indian Reservation and marvel at the Colorado River, far below, still carving the canyon ever deeper even as you watch. The Grapevine Wash has long been well traveled and is known as the Ute trail from the Colorado River south to Hopi and across into California. In more recent history the Mormons used this trail to trek their trade wagons to the Hopi and Navajo villages. In the 1820's Jedidiah Smith crossed the Virgin River, (Virgis River as it was known then) and then across the Colorado to reach the California territory. In 1869 John Wesley Powell (1834-1902), geologist, explorer, and one-armed civil war veteran, led his band of explorers through the Grand Canyon past Pearce Ferry and South Cove and they ended their river trip where the Virgin enters the Colorado. Questions or comments about the website? E-Mail the webmaster.